"There are a number of different structures plants make that are specific for ant use," explains Nelsen, who led the study with his fellow Field Museum researchers and co-authors Rick Ree and Corrie Moreau. "Some plants have evolved features that persuade ants into defending them from attack from other insects and even mammals. 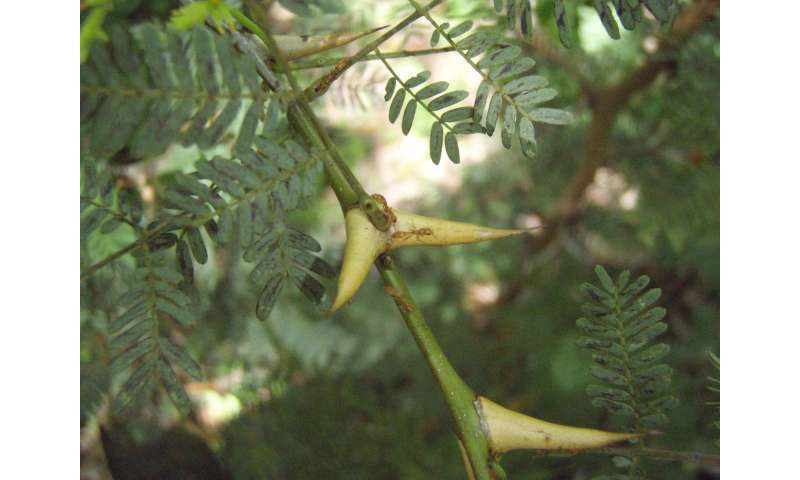 These include hollow thorns that ants will live inside, or extra nectar on leaves or stems for the ants to eat. Some ants will just cheat and take the nectar and run, but some will stick around and attack anything that tries to hurt the plant," explains Nelsen. Other plants get ants to help them move their seeds around, by bribing them with rich food packets attached to seeds called elaiosomes. "The ant will pick up the seed and carry it away, eat the food packet, and discard the seed—often in a nutrient-rich area where it'll grow better, and since it's farther away from its parent, they won't have to compete for resources." The history of ants and plants evolving together goes back to the time of the dinosaurs, and it's not easy to tell from fossils how the organisms interacted. "There are very few fossil records of these structures in plants, and they don't extend very far back in time. And there are tons of ant fossils, but they typically don't show these ant behaviors—we don't necessarily see an ant preserved in amber carrying a seed," says Nelsen. The team mapped the history of plant's ant-friendly traits and of ants' plant use onto these family trees—a process called ancestral state reconstruction. They were able to determine when plants began relying on ants for defense and seed distribution—and it looks like ants have relied on plants for longer than plants have directly relied on ants, since plants didn't evolve these specialized structures until long after ants had been relying on them for food and habitat. Crazy, crazy article! It mentions "evolved" or "evolution" 18 times, but this article has NOTHING to do with evolution. A true scientist would only say, "some plants are made to shelter ants". This is a fact. It really describes what is going on. But to ascribe this to evolution is WAY off topic, and should part of another article dealing with black magic. PLEASE keep this topics separate. It is only through Evolution that plants evolved their structures specifically to enable visiting ants to stay to protect the plants while being given food to entice the ants to stay. It is a true symbiotic relationship that benefits both the ants and the plants that they protect. Evolution was bound to happen through the millions of years that these life forms had come together. Evolution is s natural process, and later adaptation to changing situations such as climate could cause further evolution to occur. The Creator made it so. He knew what He was doing, Bart. 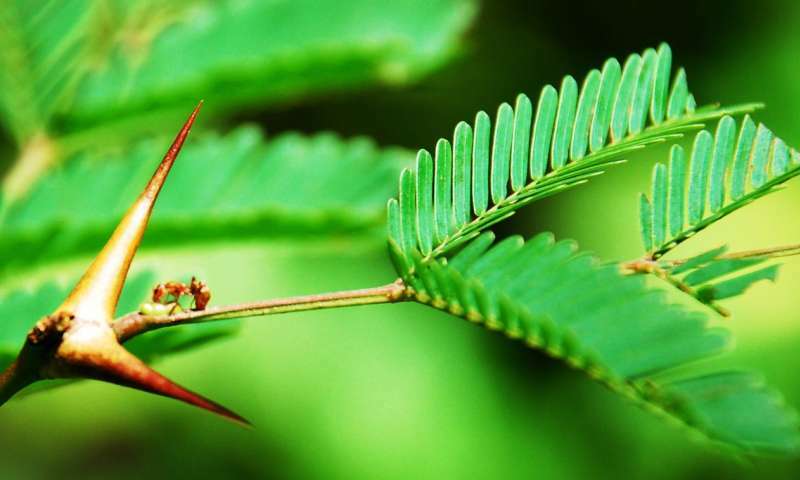 the researchers found that the long history of ant and plant co-evolution started with ants foraging on plants and plants later responding by evolving ant-friendly traits. Sorry, guys, but there is just no way to go back into history and actually observe what you are proposing here. All the examination of things in the present and then collation of gathered data does not make the deduction of evolution a valid one. As Bart_A said - you can only state what lies in front of you in this case. There is no way to repeat the supposed "evolution" to confirm that what you are inferring is actually correct. Surveillance, there is no supporting evidence that plants "evolved" their structures to support ants - that is just wishy washy make-believe in this specific case. As I said on numerous occasions - just where is the rigorous definition of evolution that allows one to do good scientific research. says Nelsen. "This study matters because it provides a glimpse into how these widespread and complex interactions evolved." NO, I disagree. Just because you have shown the patterns of ant-to-plant relationships does not mean in any way that it "evolved", primarily because darwinian evolution is impossible. Besides which, are you using the term "evolved" in a bait-and-switch manner in that you want to say the plants or ants adapted but in the background would like to show how you support the idea of things making themselves - thereby confirming your status as an ardent disciple of the humanist/naturalist religion? We also know for a fact that when it comes to applying darwinian ideas to the plant kingdom, evolutionists fail absolutely miserably. Plants just do not bend to your whim and instead obstinately and out-rightly defy any such notion. There is no discernible evidence of darwinian evolution in plants. The Creator made it so. He knew what He was doing, Bart. Friend, if you are suggesting that God created via the darwinian evolutionary process then your Christianity lies in ruins. 1. Death before sin - calls God a liar. 2. The order of creation does not line up with the BigBang order of formation, e.g. the earth before the sun and stars. 3. Exodus 20:8-11 completely negates deep time and recall - it was God himself who wrote that. 4. No gender evolution - Mark 10:6, Mark 13:19 -> "In the beginning he created them male and female". A belief in evolution makes Jesus a liar. And I can go on and on about why taking evolution as your authority on creation origins makes an absolute mockery of God's word. Why do you believe the "science" when it comes to the past but then change around and say you believe the future from the bible? Why not just go with the heat death instead of the new heavens and earth? ..but this article has NOTHING to do with evolution.. Nothing in biology makes any sense without evolution. How else do you explain how plants and ants got into this relationship? How else do you explain how plants and ants got into this relationship? Well, it was clearly a result of a late night tryst that that was forbidden by each of their respective communities and anyone convicted of engaging in such a relationship faced capital punishment. The article completely ignores the most incredible such relationship between humans and the plants we grow for food or from the plants perspective the animal they have utilized to spread across the world. They harnessed or intelligence to evolve them with a purpose, enable them to reproduce in incredible amounts and make them safe from predation. Before civilization developed of hunters and gatherers engaged in the same relationship with plants. The plants that showed the most promise humanity helped grow. Over generations, plants honed the traits that made humans want to eat them. Plants led humans to develop the first civilizations, and that's when those plants hit the jackpot. From hit and miss help humans were now an organized slave species who eagerly slaved away for their masters. In return, the herbivorial overlords sacrificed much of their young and pretend to be mindless food, proving measurable intelligence to be overrated. Humanity tamed the planet on their behalf. That is the purpose of scientific research - to find ancient artifacts such as old bones and plant life to deduce what happened at each step of the evolutionary process. Evolution take a long time - and no, there is no reversal. The first life forms in the waters of Earth were unicellular. The single-celled life were programmed with instructions that gave them the Blueprint for Evolution. When they became multi celled they split into two groups as per the Blueprint - the predecessors of all plant life and the ones who would become the predecessors of all animals. The plants were the first to get tossed onto the land, and it was those plants that provided the food for the first animals that crawled out of the waters. Some of those animals went back into the waters and became the predators of fish. They were the terrible predators of that time, and eventually evolved into mammal sea animals such as Whales and dolphins (porpoise). The Whales were not always as they are now. But through evolution they changed to be less fearsome looking animals. As to the animals that crawled out of the waters - how do you think they got to be land animals, FredJose? They EVOLVED. They lost their fins and grew legs and arms so as to negotiate the waterless land mass/islands on which they found a haven. It was in their programming (Blueprint) to change so that they could rule the land and spread the seeds to build forests and other habitats. Darwin had nothing to do with Evolution. All he did was take notice of differences and changes in spite of similarities. And YES - G-d the Creator programmed the first living cells to evolve. Prior to that the single-celled life forms had NO DNA/RNA whatsoever, since they were the FIRST, and had no ancestry. That is why the cells were endowed with the Programming/Blueprint as a "staging platform" and Support for all future conditional changes that would be based on a variety of conditions (future). Christianity is manmade, as is Judaism, Islam and all other religions. Look what has befallen the Catholic Church where priests and bishops have tossed out their religious training and have embraced homosexuality without remorse. Catholicism? Really?? Are you saying that animals and plants are capable of "sinning"? Because there were only animals and plants alive on the Earth before, and at the time that G-d created the first Man. Animals lived and died and so did plants. Animals ate plants and animals ate other animals. Therefore both animals AND plants lived and they died - but they were not guilty of Sin. It was only after the first man and woman were created that their vastly poor judgement and disobedience could be called "Sin". I would call it "stupidity and ignorance". The scribes failed to follow the exact descriptions and what they were told to write - instead, following their own poor judgement that gave Genesis1 and the nonsensical 6-day-creation period which still to this day confuses readers of Genesis. Not only is it unscientific, but it is also Illogical and Unreasonable. The same with how Christian Evangelicals declare that the Earth is only 6k to 7k Earth years in actual age by going on the ages of the biblical characters. I'm almost certain that even Yohoshuah (Jesus Christ in Greek) himself has wondered how can these humans be so stupid. Perhaps when He returns, He will set them straight. He will set everything right. Exodus 20:8-11 simply blows ANY idea of long ages out of the water. Hence there was no reason for animals or plants to die before mankind was created. I'm just wondering if you actually read the texts I included because if you did you wouldn't even be reasoning like this. Sorry to burst the bubble again - the whole bible is accurate and true. if it were not so we wouldn't be able to trust it regarding our salvation[how to know which is true or not?]. Perhaps you should read the prophets where it clearly indicates just WHO spoke to them. @Surveillance, by making the atheistic mythology (and that is all it is because there is no truth in it ) your authority regarding our origins, you have to start decimating the plain and easily understood words in the bible to fit in with that non-science. Furthermore, you are calling God a liar, saying HE doesn't know what HE is talking about, which is quite simply blasphemy. Remember, Exodus 20:8-11 was written by God Himself, no scribal intervention required. You keep harping on this, friend. Why don't you read what the bible says. "God spoke to so and so..."
Now if YOU know it was messed up, then you must have the original version as it was spoken by the angels in order to compare and make such a claim, so please go ahead and supply it to us so that we can be fully informed of the truth as it should be. The fact of the matter is that you REJECT the word of God in order to follow your own sinful thoughts and imaginings, the bible clearly spells that out where people want to follow their own ways in contradiction of God's word. "If they do not believe Moses and the prophets, , they will not be convinced even if someone rises from the dead. "Luke 16:31. This is absolutely damning. Not only is it unscientific, but it is also Illogical and Unreasonable. It is quite clear from the bible that certain things happen that are NOT of the natural order that we are accustomed to. They are generally classed as miracles. So if you believe that the statements regarding creation are unscientific then just how unscientific is the fact that Jesus rose from the dead? If that is non-science as you claim, then Christianity is dead in the ground and we are the most to be pitied. There will be no setting straight of anything because the supposed author of everything is still dead in the ground. This just points out exactly what I said before: If you bring the atheistic non-science into the word of God, you absolutely stomp on everything it says. There is no longer any rhyme or reason to it. Besides which, setting ANYTHING above God's word ( which is ALL we have to go on with ) means that you are indulging in idolatry. There is no 2 ways about it. The first life forms in the waters of Earth were unicellular. The single-celled life were programmed with instructions that gave them the Blueprint for Evolution. Firstly, Not according to Genesis 1 it wasn't. Besides, where do you get this information from? Who was it that actually witnessed this event and recorded it for our perusal? Yes, that's right - no one - and that's as expected since it is all a made up story by the atheists. God was the only eye-witness to His creation and since He was in direct relation to Adam at the time before sin, He told Adam how it all came about. That is the most reasonable thing. Then Adam related that to the rest of his offspring and so on. An eye-witness account that trumps the mythical story of the first ancestor. Secondly, where did the programming come from? The atheists do not involve ANY intelligence in their myth so just who did the coding? There is no "GOD" in their worldview so YOU are putting a god in there. @Surveillance, Please, man, I also once believed the atheistic non-science until I submitted to the words of Exodus 20:8-11. That simply ejects ANY notion of long ages and evolution for me. I gave it up and started looking for answers for all the questions that arise from a 6-day creation. You too can find it at creation dot com and answersingenesis dot org. Their search engines will provide answers to any questions you have and if not you can ask their PhD scientists anything you like. Right now, as it stands, you are fully in the camp of the enemies of God since your story is precisely the same as theirs, so please get out of there, it is ALL non-science that fully defies even the most basic principles of chemistry and physics to work. It needs miracles, which ironically, the atheists fervently deny! The bottom line w.r.t. the article is that plants did NOT evolve their accommodation and neither did the ants need any evolution to use plants either. G-d did not write the Bible. It was the scribes who wrote Genesis and by doing what they did to that first chapter, those scribes somehow were not blamed for the discrepancies that they wrote - but the blame was placed on G-d for those errors, rather than where it belonged. It is your choice of what to believe, as it is the choice of all others what to believe or not believe - and to live their lives in whichever way they choose. I tell you that the first verses of Genesis are misinterpretations and miscalculations committed by the scribes who basically ignored what they should have written and, instead wrote illogical gobbledegook for their own reasons. Anyone who is interested enough could understand that the part of Genesis that supposedly describes the creation of Earth, the Stars, the Moon and the Cosmos simply doesn't make any sense in the way it is written. What YOU seem to believe, is that the Creator wrote text that makes no sense to anyone with a working brain/mind. If you take each part of Genesis and work it out in a logical manner, you will suddenly come to the realisation that it was the scribes who wrote it incorrectly and it was left that way, rather than corrected. G-d doesn't do mistakes, only man makes mistakes. It is so obvious that the scribes who wrote Genesis had no idea of such large numbers as millions and billions of years. They could hardly think in terms of thousands, much less in greater numbers/amounts, and their only forte' was their ability to read and write. They obviously were not in charge of counting the amounts of grain in the storehouses, so that their math/counting ability would not be quite as keen as someone who had to learn how to do the maths for accurate record keeping purposes. And you're in the camp of those who desperately need to fool themselves into thinking they have all the answers. Go preach somewhere else- you have no need for science and science has no need for you. A couple years ago, my aunt had to have her right foot removed. All my cousins- very religious to a person- asked us all to pray that god guide the surgeon's hands and grant my aunt a speedy recovery. They even specified the time we should be praying. I asked them why we didn't just pray for god to grow a new foot on aunt Mary's right leg. They were quite upset and one even said, "god doesn't follow the minds of men" or something like that, not realizing the absurdity of what they said, especially in light of the other supernatural intercessions they were praying for. So, it's OK to pray for something that's invisible to inspections looking for any "miracle" or violation of physical laws, but not OK to pray for anything that would show god to be completely impotent if it didn't happen. This is the reason you never ask god to drive your car for you. You seem to have forgotten that the Creator doesn't interfere in mans' choices, but allows men (and women) to choose the paths they prefer to follow - which always have good or bad consequences, as the case may be. You made them think that you also were going to pray with them, even though you may not have had any intention whatsoever of praying for anything or anyone. It would have been better if you had just told them the truth that you don't believe in God's existence instead of making a foolish comment that God should cause your aunt to grow another foot, which you knew already wouldn't happen. Your cousin was right. God, indeed, doesn't follow the minds of men - one of the reasons being that men are stupid, as evidenced by what you had said to your cousins. They were being sincere, while you were not. Perhaps you felt very good after that and felt proud of yourself. And WHY should God cause your aunt to grow a new foot when God doesn't even cause military veterans to grow new arms and legs that were lost due to war? Wars and conflicts and bad choices are all manmade things. Every bad thing that happens is most often done or caused by man - not G-d. This is because He gave humans free will and the intelligence to make their own determinations which path and lifestyle they preferred to follow. Any bad consequences coming of it cannot be blamed on the Creator. Would you ask G-d to take your free will and choices from you so that you can place blame on G-d instead of on yourself or another human? Evolution itself is not a choice, but something that happens out of necessity. Perhaps a better chance at survival. But sometimes it can go wrong, as in certain adaptations that cause animals to lose their fear of predators. Let me clarify what I meant. What I meant was not that fish "lost" their fins, but that those fins EVOLVED into legs and arms. With birds, they evolved into legs and wings. But in any case, it was the animals/mammals that had evolved from their former one-celled existence, and then multiple celled animals - then ocean dwellers - who became land dwellers. But none of those mammals became human. Those mammals/animals EVOLVED - while humans were CREATED. Phyllis Harmonic> I asked them why we didn't just pray for god to grow a new foot on aunt Mary's right leg. They were quite upset and one even said, "god doesn't follow the minds of men" or something like that, not realizing the absurdity of what they said, especially in light of the other supernatural intercessions they were praying for. Let me clarify what I meant. What I meant was not that fish "lost" their fins, but that those fins EVOLVED into legs and arms. With birds, they evolved into legs and wings. it was the animals/mammals that had evolved from their former one-celled existence, and then multiple celled animals - then ocean dwellers - who became land dwellers. But none of those mammals became human. Those mammals/animals EVOLVED - while humans were CREATED. One of my most favorite second-rate movies is "Water World". In that movie, the protagonist appeared completely human, except for one thing: he had a pair of gills on either side of his neck. He could stay and breath underwater indefinitely. I like that. While it is highly unlikely that the sea will cover all landmasses again, it certainly would have been nice to have been given a good pair of natural gills. during gestation. No snorkel or air tank required. I have looked at FredJose's recommended websites, but there is nothing that can convince me that Evolution is impossible. IF it had not been possible, then animals and plants would have remained as one-celled life forms floating about without fins and mouth/organs - without ever changing. But as I had said, it was the ancestors of animals and plants that had undergone such evolutionary processes throughout millions of Earth years. WRT SeaLions and other aquatic animals such as whales and dolphins(porpoise), whales were too heavy and bulky to live on land so that they never lost their fins. Sea Lions and walrus ancestors apparently tried to live on land full time, but they never were able to grow legs and arms, so they went back to the sea even though they had already lost their gills by then. Sea plants were tossed up onto the land first and took root; then, when the sea mammals moved onto the land mass and their fins evolved into legs and arms (lizard-type) they already had food from the vegetation that had preceded them onto the land. If the animals had gone onto the land first, they would have found no food and would have gone back to the sea. That is why it was chosen that plants would be first on the land, then animals. Interesting article today wrt latter-day brain evolution in a fish specie. If the basic Design works well, then why make too many drastic changes? Some modifications would be permitted - as needed and under certain conditions. But all in all, the original skeletal Design and its designations should be adequate through aeons. Consider the design of the Model T Ford - petrol motor - original clunky body, certainly not built for speed - adequate wheels and brakes. But throughout the years, new innovation improved the original - and yet, the Design is still there under all the newfangled improvements - the bare bones of it remains. The difference is that the original car Design is by HUMANS, and yet, the human brain's ability to perfect the car was the result of Intelligent Design to make it possible that humans could travel faster and a longer distance than running on foot. Nothing happens by accident, granville. There is a design and cause and effect for all. God, if only you were clear and said what you meant and what you meant aligned with reality (and if only you checked that those damned scribes got it right) Fred and SEU would not be at it like this. Quite inconsiderate of you, allowing two of your biggest fans to fight like that. Shame on you god. What we are saying does align with reality. While granville was referencing the physical attributes, purposes and effects of the human and animal bodies wrt the evolutions of animals as they transitioned from the waters to land, I was referencing the unphysical or the immaterial which is the spiritual realm that is an essential part of reality. And FredJose refuses to acknowledge the changes that can occur physically throughout the history of life on Earth. As I have said more or less, God allows humans to make their own choices as to which side they are on; what they prefer to believe/support; and to understand if they wish, the differences between what they have chosen and what they choose to reject. But some make their choice without first examining what the other choice(s) are all about and involve. So that when they take sides it is often based on ignorance and some form of bias against that which they can't agree with. But that is their choice to make. I was referencing the unphysical or the immaterial which is the spiritual realm that is an essential part of reality. The immaterial has never existed (apart form in peoples imaginations), per definition it is insubstantial. Why anyone in this day and age would think it's real is...let's just say it's not rational. There has never been any evidence for any such thing and there never will be. It's just wishful thinking and therefore has no place on a science site. All your posts that refer to anything "spiritual" is off-topic. If these comments were moderated the way the forums are you would be warned and then you would be banned if you persisted. You, Benni, theredpill etc. are just lucky the guidelines are not being enforced anymore. Do you realize you all accepted the following when you joined? You are violating the terms you agreed to. You deserve all the crap you get. Creationism IS science. All that matters to you is all that is made up of Mass/Matter. There would be no science except through the Creator. And that's a fact. Also, in case you have never heard of it - there is POLITICAL SCIENCE that is taught in Universities. How do you always get everything so completely wrong? It is 100% NOT science. Which come to the original point? How did it evolve the skeleton in the first instance? Why has natures skeleton stopped evolving? Why has nature's skeleton stopped evolving? No it is not. It is pure faith-based woo. Who created the creator? The Creator was not created. The Creator is Pure Energy and PureThought. He has always existed. Since YOU are made out of Matter, there is no way that you could ever SEE the Creator in your present state. If you were able to see Him in your present material state, you would die. This is why you were endowed with 5 senses and a large brain to think with so that you could learn and understand your own weaknesses and limitations, and to be able to surmount those limitations and overcome those that you are able to. You seem to have a bias against "faith". Consider that when you were a child, you had faith in your parents to protect you and provide for you. When you grew up, you became independent and didn't need them anymore. But you probably still remember that you had faith in them. If they beat and starved you, then you would have lost that faith in them. The bone structure is the scaffold upon which everything else relies on to support and carry the weight thereof. Everything else other than the vital organs is just "window dressing" that is changeable. Why weren't the sharp teeth of predators "designed" to eat grass? Well, it appears that the creator had limited creativity, in that skeletal similarities only indicate incremental updates to adapt to local environmental changes. They became predators later and their food were the grass/vegetation eaters. Predators are known to eat grass on occasion, usually during an upset stomach. This all happened sometime AFTER the demise of the dinosaurs. During the time of the dinosaurs, small mammals would have been eaters of grass, grain, seeds, leaves and other vegetation. Stuff that could be taken into their tunnels easily. The skeletal system in all life forms - fish, mammals, amphibians, etc. are all similar as the scaffolding to support muscle, tendons, soft tissue, etc. no matter what the species/genus. Bacteria, amoeba, paramecium have no such scaffolding. Without that bony scaffolding, they would not be able to walk, sit, stand. You would be a piece of coral with an outer skeleton, IF even that. The Creator's creativity was perfect. After the first life forms were created, their bodies conformed to the program/blueprint that allowed them to evolve. It is doubtful that the Creator had anything to do with any further evolution of animals and plants, and instead, let nature take its course. This planet is not the only planet to harbour life, you see. There are many others, trust me. Oh, and by the way - man and other mobile life forms are Machines - Organic Machines. Plants are also - to a certain smaller extent - but not as mechanical as Man, Animals, even Fish. 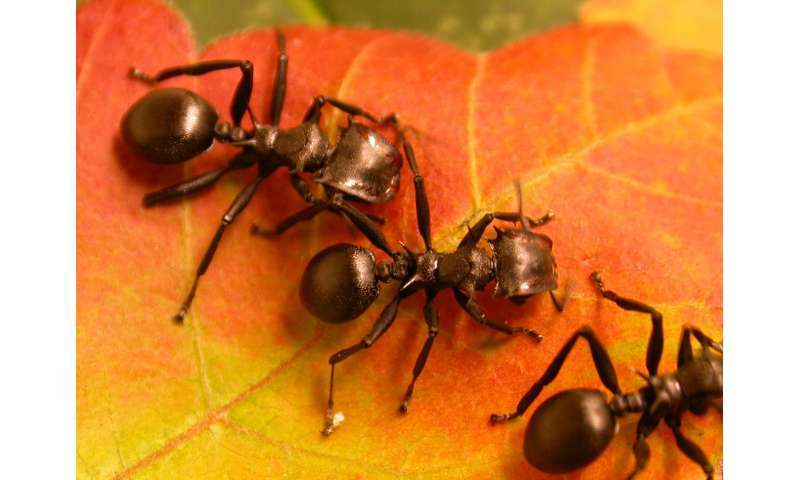 Plants may help ants, but ants seem to not care about that too much. I watch ants bringing aphids to the tender young tips of my grapes every summer.... then I know it is time for a dose of Sevin. Depending on the extent of the infestation by aphids, you might want to try soap and water sprayed on the leaves rather than using an insecticide. Dishwashing liquid, I hear, is a good choice. You can also rub them off with your fingers if you have the time. I find it fascinating how ants milk their aphids to drink the juices. Another natural symbiotic relationship. Good luck with your grapes. What if it's the ants making the PLANTS do what they want them to? There are many symbiotic relationships between plants and animals. This is just one of them. So are you saying that it is either the plants or the ants that are the slaves to the other? I think that it is a mutual benefit "society", rather than a mutual admiration one. One or the other is winning/getting a prize for being helpful - and after awhile, it became instinctive and was expected. Evolution was part of the design, else the whole thing would have been static and had never progressed, no improvements, nothing beneficial - so that is why everything evolved, as needed. Underneath all the packaging, the cells are the ones who determine what, when, how, where, and why. The why is determined by the conditions, climate, and pertinent factors that, if the change doesn't occur, the organism could die and will not be able to pass on its traits.